"If you have nothing worth saying, keep your mouth shut." Artifice used to be a bounty hunter, and a good one. He wasn't designed to be a bounty hunter, his color scheme alone would draw too much attention, but he was able to use things in his surroundings to build crude disguises and gadgets to help him sneak up and capture his bounty. Though he enjoyed his job, Artifice felt too strained by it. Frequent system shutdowns and un-repaired injuries proved to be too much for him, but he still felt the urge to fight evil. Because of his former line of work, Artifice now has a better ability to see who he can trust and who he can't. Due to the fact that he was always traveling, Artifice didn't have a lot of friends. Due to his dislike of small talk, he only speaks when he feels he has something important to say, and occasionally around friends. 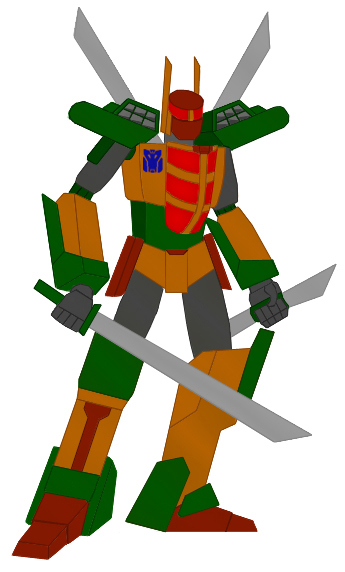 In robot mode, Artifice carries a katana blade and a two-way knife. He has no formal training in the usage of either weapon, but he has high natural ability and ingenuity to use both with a high level of accuracy. Artifice can also spin both hands 360-degrees at high rates of speed, which make his hand weapons spinning blades. He also has dual shoulder missile launchers capable of simultaneously launching up to 12 missiles a distance of 3 miles. 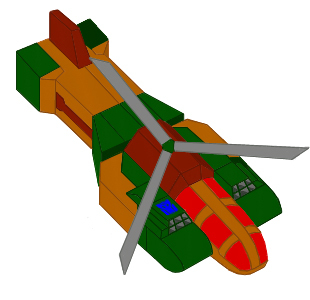 In helicopter mode Artifice also uses his dual missile launchers which gain the ability to fire in a 180-degree range. Artifice joined LONAC because bounty hunting proved to be to stressful. LONAC seemed to be more laid back and could always be a safe haven, unlike the Autobots or Decepticons who were constantly at war. The LSS Freedom now gives him something he always longed for - a place to call home. Even though he is a Cybertronian, he never felt very attached to Cybertron because he spent most of his time traveling. The LSS Freedom could always be with him no matter where he went.